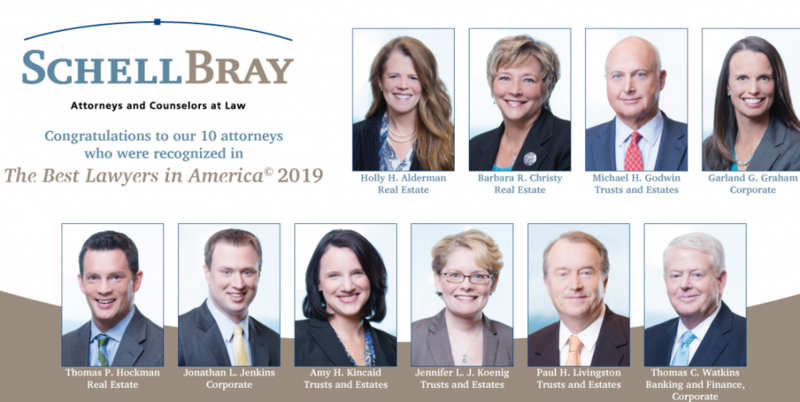 Schell Bray partners Holly Alderman, Barbara Christy, Mike Godwin, Garland Graham, Thomas Hockman, Jonathan Jenkins, Amy Kincaid, Jennifer Koenig, Paul Livingston and Tom Watkins have all been recognized in The Best Lawyers in America 2019. Their practices include real estate, trusts and estates, corporate, and banking and finance. Within these practice areas, they provide comprehensive services in a variety of areas that are designed to meet the needs of our clients. Congratulations to the attorneys included in The Best Lawyers in America 2019!